The attached text is an abridged translation of 'L'abolition de la valeur', to be published in 2016 by Editions Entremonde, Genève. 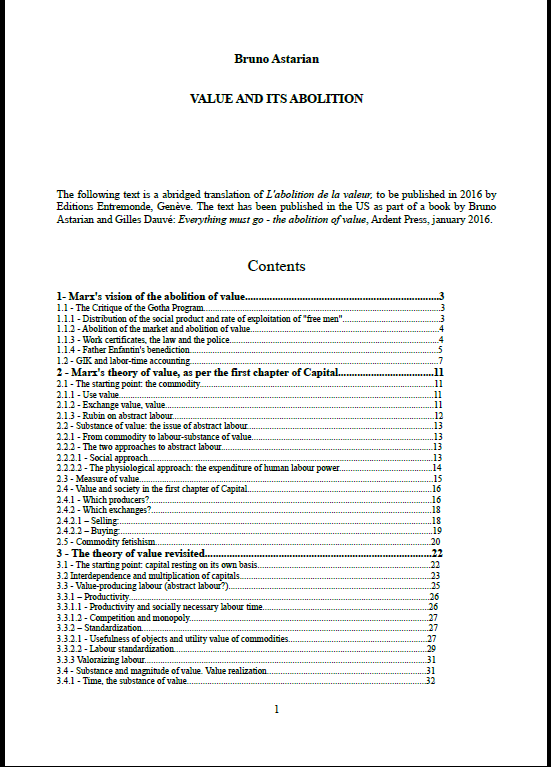 The text has been published in the US as part of a book by Bruno Astarian and Gilles Dauvé: Everything must go - the abolition of value, Ardent Press, January 2016. Let us try and think what a society without work could be, i.e. not without production, but without factories, stopwatches and the suffering brought by them. Our approach is to go back to Marx once again. Value and its Abolition aims at revisiting the Marxian theory of value by taking into account the present conditions of the capitalist mode of production. The main difference with Marx’s (and Rubin’s) time is that it has now become impossible to conceive of communism as a society of associated producers. First we will make a critical reading of some of Marx’s key texts on the subject: his Critique of the Gotha Programme, which provides us with his most complete vision of communism, and the first chapter of Capital. Can we still regard this chapter as the founding stone of a theory of value adequate to our time? As far as the method is concerned, yes; but not regarding its results. It then becomes possible to cast in concrete the theory of value, by discussing the concept of abstract labour, as developed by Marx of course, but also by Rubin. We will follow the Marxian approach and extract from different concrete forms of labour what they have in common in order to find what makes commodities exchangeable. We will bring out two practical and social determinations which define any value-producing labour: productivity and standardisation – the necessary and sufficient conditions for the exchangeability of commodities. If casting in concrete the theory of value is now possible, it is because superseding the capitalist contradiction can only be envisaged today as the superseding of work as well. The notion of abstract labour was theorised by communists who could think of nothing better than to project into communism the same work as the one done by the proletariat – albeit freed from the excesses of exploitation. Therefore they invented within work an abstract dimension, supposed to be the source of value, and which communist planning could get rid of. Value and its Abolition simplifies the labour theory of value without discounting the validity of the overall architecture of Capital. Besides, casting the value theory in concrete terms has an impact on how we perceive the abolition of value. Marx and a lot of Marxists conceive of it as the abolition of the market via planning. We can now think of it as a negation of productivity and standardisation, with two major consequences. First, revolution will invent ways of producing without productivity, which means that producers can do something else at the same time as they are producing. Secondly, it implies a production that is not normalized because it is particular to those who engage in it in one way or another, either as “producers” or “consumers”, and in fact the two functions can no longer be differentiated. This leads us to the notion of a “totalizing” activity, where no productive act is only productive: this is what abolishing work is all about. The following text is a abridged translation of L’abolition de la valeur, to be published in 2016 by Editions Entremonde, Genève.